Yesterday will be repeated today... with the rain. I do expect to see slightly stronger storms today than yesterday. Above is a great panoramic shot by a friend in Hilliard, Ohio. Quite impressive. Even the radar was impressive. 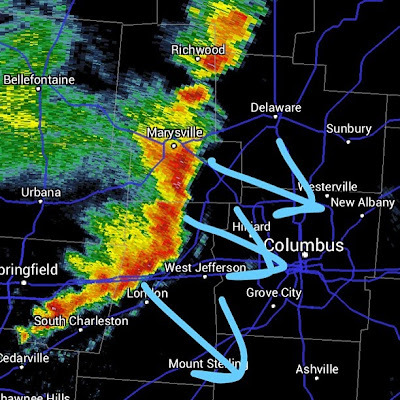 The line of storms had strong winds and some embedded hail that was being reported. And then... The storm just died out. I was out with some of my meteorology friends for dinner and we were all excited for the storm then watched it slowly die out. Earlier in the afternoon we had storms move through the metro area, and by the time these storms pushed thru there was not as much energy. 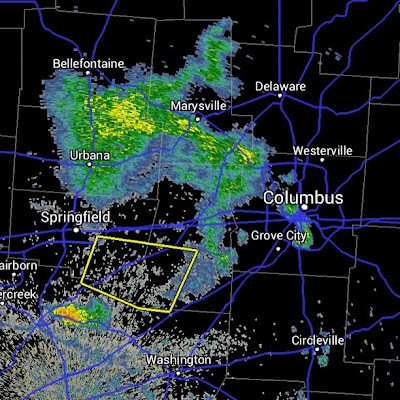 Oh well, we did get a few showers, but nothing strong or severe in the metro area. 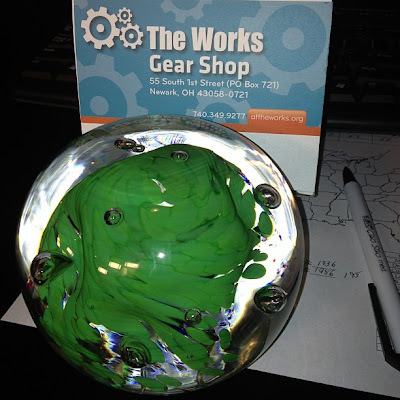 So you may remember a while ago when I made a glass paperweight at The Works in Newark for our Ohio Road Trippin segment. Well that week was one of the last weeks that I reported. I have been doing weather five days a week since and have not been back to Newark. I saw that Jen French was in Newark yesterday for a story and she was kind enough to stop by and pick this up for me. Super excited to see how it turned out. I love it. Thanks to Jen and The Works! Well for today we are tracking more showers and storms. They will still be scattered, so not a guarantee that everyone will see rain, but a little better shot than yesterday. We could see a few gusty storms with some small hail, but the threat for severe weather, again, is pretty low. The good news is that tonight a cold front pushes through dropping our humidity for the weekend, leaving us a little cooler, and providing plenty of sunshine. It looks fantastic for any outdoor activities. Maybe a little cool for a day at the pool. Rain holds off until the middle of next week, after today. Have a good one!